ActiveGate plugins are designed to monitor remote technologies that are beyond the reach of Dynatrace OneAgent. Because of that, each device needs to be defined explicitly. We call it the technology endpoint and define it using the plugin configuration. Apart from Endpoint name and Choose ActiveGate fields, you can specify your own in the JSON plugin. The values you set in the UI are later available to refer to in the plugin Python code. dropdownValues (optional) - used only for Dropdown property type. It must not be empty and you must declare a default value. 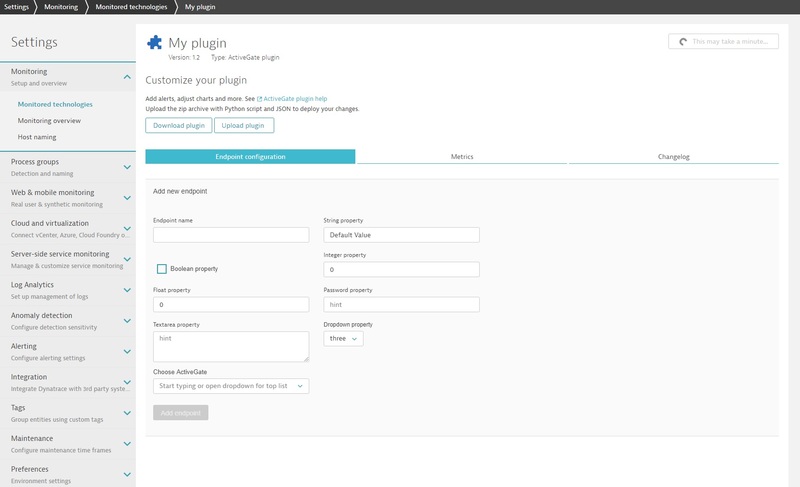 The plugin JSON enables you to provide the description of your properties. This is optional, but it gives you control over the look and feel of your configuration in the UI. Edit the configUI section to describe your properties presentation. displayName - describes input label. Property key will be used if not specified. displayHint - describes placeholder for property input. Empty by default. displayOrder - allows input order change. By default it goes with declaration order. See ActiveGate plugins reference for more details.